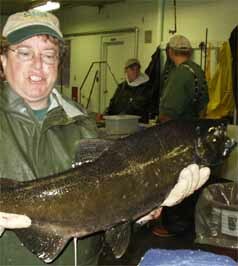 The Salmon Project was begun in 1994 by then third grade teacher, Kevin Hughes. When Mr. Hughes became elementary principal, Mrs. Catanese took over as "Salmon Project Director". This has been a valuable third grade science program at the Onekama School. The 9th Year At the Weir October 2002 (2002-2003) Dec. 2002 Hatched! Onekama students of all ages are engaged in Learn and Serve Projects. The eggs from the weir are raised in the classroom. The small salmon are released in Bowen Creek.